This morning, I saw something that made me feel good, in advance, about any tag lines or campaign themes I might come up with for ADCO this week. “Huntin’ is good!” it insisted. Not just hunting, but huntin’, which I suppose is meant to convey a certain deep and informal intimacy with this particular activity. But I declare, I don’t believe I’ve ever run across anything as vanilla as that in my life. There was no indication why huntin’ was good, or why anyone might think it wasn’t. It didn’t say it was particularly good in this or that locality, or at any particular time. Nor did it bother to reach for any adjective more descriptive or precise or evocative than good. It was a marvel, and I had to look it up on my phone during the morning meeting at work. 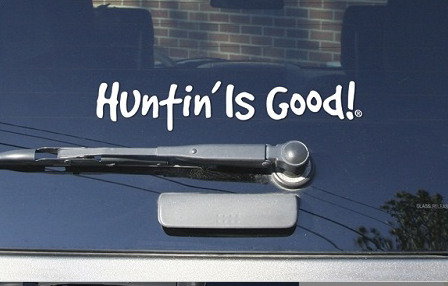 That’s where I found this website, huntinisgood.com, which offers all sorts of merchandise, such as the very decal I had seen. The website seems dedicated to perpetuating the art or hobby or whatever of hunting at a time when the number of hunters is dwindling in our once rugged, intrepid nation of pioneers. I had known that. I had read before about how the industry was worried about how few children of hunters were taking up their forefathers’ outdoorsiness, and how marketers were trying to entice the kids, as well as women, to the pasttime with such innovations as pink rifles. Tracking Down An Industry-Wide Problem. Across the United States, and for well over three decades, the population of hunters in our country has been on the decline. Since 1975 alone, the number of hunters in the field has been reduced by over one third. Since the issue of attrition within the hunting community has only recently become a cause for serious concern, usable research is still limited. But just as writers, industry experts and retailers all speculate on the causes, we have developed our own list of suspects which have created a negative impact on the hunting culture. Erosion Of The Family Unit. With divorce rates and single parent families on the rise, the number of Dads and Grandfathers in a position to mentor our youth, and pass on an appreciation for the hunting culture, are dwindling fast. The Anti-Hunting Community. Highly organized, with seemingly unlimited budgets, their goal, simply put, is the elimination of the hunting industry. The Lure Of Technology. These days, our children are “jacked-in” to video games, hunting only in Cyber Space. They’ve become masters of Wi-Fi and pixels, not the way of the woods. Industry Fragmentation. We have evolved into a highly fragmented industry… bow hunters, turkey hunters, rifle hunters, safari hunters, duck hunters, muzzle-loaders, gator hunters, low-fence, no-fence, high-fence… it’s all become a lot of nonsense! The day is fast approaching when we all must decide a course of action, or face the reality that our industry, and the way of life it represents, may become extinct. It’s time we draw the line! The Hunting Tradition, and its’ Way of Life, needs your help! Please wear your HIG gear soon and often. This will let other’s know, what you already know, Huntin’ Is Good! I’ve never gotten into it myself. I like to go out shooting now and then with my uncle in Bennettsville, who does hunt, but I prefer to shoot at tin cans and pine cones to living things. On account of the fact that pine cones don’t have to be skinned and dressed and butchered and put up in some freezer bigger than the one I have at home. They’re just a lot less trouble. This entry was posted in Driveby, In Our Time, Sports, The Nation on July 2, 2012 by Brad Warthen. Meh. Just marketing. Hunting is alive and well. To give you a specific example, there are waiting lists to go duck hunting on DNR land. @ Bryan – I think there’s a lot less places to hunt than there used to be, or you have to go further away to get to them. As for me, I prefer to hunt the most dangerous game. It’s right below his IPTAY sticker. Gun people are really a paranoid bunch. Is there really a concerted effort to eradicate hunting? If there was it would have zero chance of succeeding. Is this an emailing from the NRA? Somehow, I got on the SPAM list of the NRA. I reported the SPAM to the domain registrar of record, GoDaddy.com, which has a firm policy of terminating domains that spam. Since GoDaddy.com’s CEO and ex-Marine, Bob Parsons, is a gun-toting registered life-time member of the NRA, he waffled. @kc – You do realize that in the wild old animals get culled from the herd. In this case the elephant and lions shot were rejected by the herd and out on their own. These are the animals that are bid out to be hunted. So either they die by shooting or starve or more likely get attacked by packs of animals to complete the food chain. @ Ralph – can you report “Chef John Mitello” for me? Somehow I’m on the “Let’s Cook” spam list with no way to opt out. Huntin is good ! Sums up hunters taking charge of their heritage & remarkably protecting renewable resources . Tremendously benefiting many nongame species. Thanks for getting all of us together !